When business goes global, usually a localized version is required to meet the demands of customers. Luckily, Magento 2 allows to implement a multilingual store with a single installation. The solution is quite simple. We already walked through the process of creating multiple Magento 2 multi language stores from a single installation. Now, establishing a localized version of the store is quite simple process. separate website – using this method you will get a new website with unique name. You will be able to create multiple stores and store views to assign to it. new store – in this case you can establish a brand new store within the current website. This may be useful if you are planning not just a localized version but more serious differences. localized store view – is the most easy way. Adding a new store view allows you to simply add a localized version to your current store. Each method requires some actions from you to perform. If you decide to create a new website, you’ll need to create a website, then add a store and complete the action with a store view. If you choose to add a new store to your existing website, you’ll need to add a store and store view. Finally, if you need just a localized version, a new store view will be enough to meet to your requirements. To create a new store view go to your Magento 2 store admin panel. Select the Stores tab and choose the All Stores option. Then, hit the Create Store View button. You need to select a website to assign this store view to, fill in the name and the code of the chosen website. Additionally, you’ll need to enable this store view and define its sorting order. When done, hit the Save Store View button. Then, go to the Store tab and select the Configuration option. At the top of the page you can switch between store views using the corresponding menu. 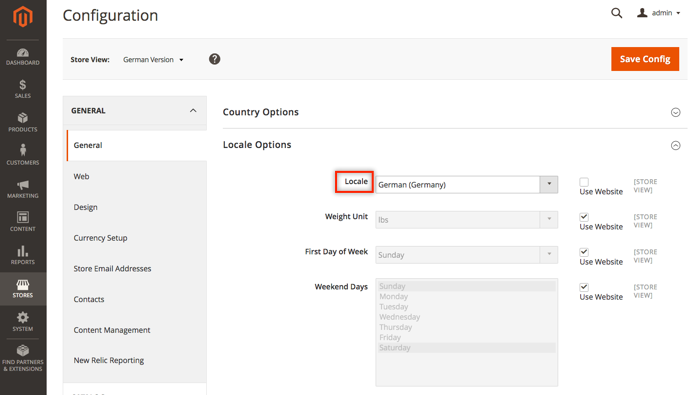 Choose the store view you need to localize. Next, expand the Locale Options section and modify the locale option. Hit the Save Config button to complete the process. Using the instruction above, you can add a localized version to your main store. However, you’ll need to create or purchase additional Magento 2 multi language module that will automatically switch customers to a certain store view or localized version. Otherwise, your customers will need to change localization manually.